To help you find your way around, the Raspberry Pi includes a file manager app called File Manager. Files are the information you store on your computers. To keep files organized, they’re often kept in folders. Folders can contain more folders. Or more files. Or both. 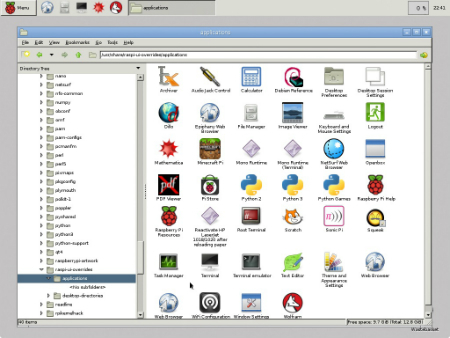 You can find the File Manager icon to the right of the web browser icon in the Raspberry Pi taskbar. It looks like a battered filing cabinet. To launch File Manager, click the icon. The following figure shows the file list that appears. File Manager shows a list of folders at the left of the window. To see the files inside a folder, click it. The files appear in the right of the window. To see the folders inside a folder, click the tiny triangle next to the folder name. When a folder is open — showing the folders inside it — the triangle points down. When a folder is closed, the triangle points to the right, at the folder name. The complete list of folders is called the directory tree because it’s a bit like an upside-down tree. The tree builds down from a root, which is the super-important everything-starts-here folder. This folder is so important it has a super-important name. It’s called / — a single backslash. Maybe / is easier to type than thisisthesuperimportantrootfolder. If you refer to figure above, you can see that the superimportantrootfolder includes a lot of other folders. They hold the files and folders that make your Pi work. You can also see a folder called pi at the top of the list. This is your home folder. Every user on a Pi has a home folder. Because you spend a lot of time at home, File Manager includes it in the directory tree so that you can get to it quickly without having to find it in the main tree. Does this mean it’s in two places? No! There’s only one home folder. But you can get to it in two ways in File Manager. One way is a quick-click to save you having to take the long way. The other way is the long way. It takes a lot of scrolling and clicking, so it’s very handy to have a shortcut. The directory tree gives every single file in your Pi its own address — which is just the list of folders you need to click through to get to the file. File addresses are also called paths. Getting to an address is a bit like walking down a path with lots of side alleys and turnings. Click the /pi folder inside home. Keep clicking folders to look inside them until you get to the folder you want. As you open more and more folders, File Manager always shows you where you are. It’s hard to get lost. See whether you can click your way through the address to find the files. You’ll need to scroll down through the tree to see all the folders in /usr/share because there’s a lot of stuff in there. The following figure shows all the apps in File Manager. The folder includes the apps in the desktop menus and some others. You can double-click any of them to launch them. While you’re in this folder, you may want to try setting up WiFi with the WiFiConfiguration app. Double-click it to launch it. The Pi isn’t great at WiFi. For example, it doesn’t scan for networks automatically. The best way to find full instructions is to search online for WiFi Pi setup.